Across Canada, digital health is transforming the way people receive health care. Digital tools and apps are changing how patients and physicians interact. They’re helping physicians make decisions and improving collaboration between health teams. They’re also boosting patient safety and empowering Canadians to manage their own health. Bayshore HealthCare is embracing the digital health revolution with modern information systems, high-tech tools and a commitment to innovation. 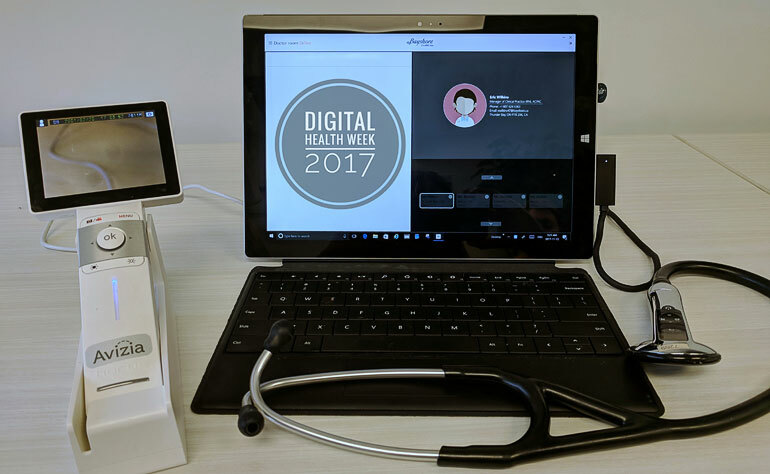 In honour of Digital Health Week (Nov. 13–19), we talked to Shelley Burnett, National Director of Digital Health and Innovation, about what’s on the horizon. Q: Bayshore is increasing its focus on digital health and innovation. Why is the company taking this direction? A: Health care lags other industries when it comes to using innovative technology solutions, not just in Canada but around the world. There’s so much opportunity to deliver services and care in different and more efficient ways. Also, people’s expectation of how they interact with the world has shifted. You can order everything from taxis to take-out using your smartphone. If we want to keep delivering best-in-class health care, we need to innovate. I look at my role as being a connector for the organization and the world outside. It’s important to look at what’s coming and try something different. Q: Can you share some examples of digital health solutions that Bayshore is exploring? A: We have several exciting projects on the go. We’re doing virtual visits for people with rheumatoid arthritis in Thunder Bay, Ontario, who have limited or no access to specialists. With the help of a specially trained nurse, we connect them to specialists in the Greater Toronto Area over video chat. It transmits live in real time biomedical information via Bluetooth enabled medical devices. This saves patients travel time and expenses, and it reduces wait times. Since its launch last summer, this pilot project has been very successful, and we’re looking at rolling it out in other parts of the country. We have programs that use mobile devices to effect behavioural change. We’re working on a new platform for digital health solutions – it’s like the foundation for the house we’re building. Last but not least, we’re working with our Preferred Pharmacy Network division to better engage patients and make their experience more seamless. In every other part of our lives, we consult our smartphones, but when it comes to health care, we still pick up the phone and call somebody. We’re looking at how to engage with people differently, in ways they want to be engaged with. Q: How will Bayshore’s investment in digital health solutions benefit clients and their families? A: It’s about connecting to and sharing information between patients, family members and health professionals. Some individuals don’t need a face-to-face visit to receive support and care. How can we still deliver care and peace of mind? How can we communicate critical information about health care, quality of care and quality of life? How can we better integrate with people’s lives? We’re not trying to eliminate phone calls and emails, but if someone prefers to get information about their own care or a loved one’s care through an app or a device like Amazon Alexa or Google Home, that’s something they should be able to do. The goal is to ensure that our clients, customer or patients can connect in the way that they most prefer. Q: Bayshore is opening a Design Studio at its head office. Can you tell us about it? A: The Design Studio is a space where teams at Bayshore can create and collaborate. It’s a space that says, “We want you to leave behind your day-to-day and focus on what we can do together.” We’re investing in design thinking. The best solutions will come through a co-design process – for example, between Bayshore and families, or Bayshore and physicians. We can bring people in and think about health care problems we’re trying to solve. This space facilitates that. It’s open to anyone within Bayshore who has an innovative project or is looking to do co-design work. Q: Is Bayshore looking into artificial intelligence (AI)? A: Yes. We’re looking at how it can influence and deliver care, create a better patient experience and improve sharing between care teams, families, Bayshore caregivers and patients. It’s an area that offers great potential for Canadians and the health care space. We’re also looking at partnerships with other health care providers, such as hospitals, and how we can deliver care differently for their patients. There’s such breadth and depth of knowledge in Canada around tech and digital health specifically. I look for the best partners to solve the problem we need to solve. Sometimes those skills are within Bayshore and sometimes they come from outside. Q: Anything else our readers should know about Bayshore and digital health solutions? A: There’s immense opportunity, and our capability for digital health solutions is limited only by our willingness to try something. We’ve seen that clients and families are very open to giving us feedback and co-designing solutions. I’m all for that! We’ll get better solutions with the participation of people who are going to use them.